The Barclays Premier League (with Barclays, Sky, Carlsberg, NBC & ESPN advertisements). Brands (Nike, Adidas & Puma) with a highlight into the advertising strategy for Adidas at London 2012 with Sid Lee’s advertisement “Take The Stage”. Athletes (Cantona, Zidane & Bolt) with a focus on the Eric Cantona advertisements in France and the UK. Laura will present a case-study of the long-running RunLondon advertising campaign – see details of the 2005 campaign. 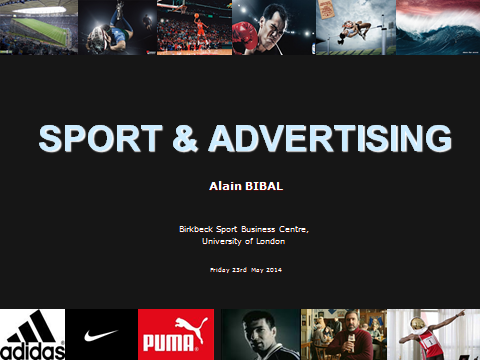 Alain Bibal is a manager in the Sport Department of the Mayoralty of Paris. Previously he worked in advertising in France & Australia. He also lectures at the ISC School of Business, University of Paris 11. At 50, he still plays Water Polo for the Racing Club de France and is a former marathon runner. He’s also member of the French Art Director Club.